NEW YORK, July 25--Clive Cussler, a best-selling novelist who writes about marine adventure, is something of an adventurer himself. With the proceeds of his novels, he explores the ocean's depths, in search of fact, rather than fiction. Today, Cussler announced that with a chartered vessel and sophisticated sonar equipment, he has pinpointed the location of two important historic wrecks, the German submarine that sank the S.S. Lusitania on May 7, 1915, and the S.S. Leopoldville, which was torpedoed in 1944, claiming the lives of 800 American soldiers. The U-20 sub torpedoed the luxury liner Lusitania off the Irish coast, drowning 1,198 passengers, including the millionaire sportsman Alfred Vanderbilt. The ship went down in 18 minutes. Inflaming American opinion against the Germans, it set the stage for U.S. involvement in World War I. The sub sank in shallow waters off the west coast of Denmark in 1916. The Danish admiralty had tried to blow it up in 1925 because its conning tower was sticking out of the water. But as the coastline eroded, its exact location was lost. 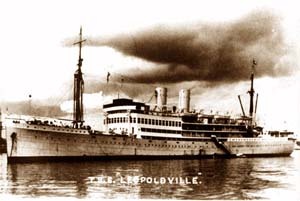 The troopship S.S. Leopoldville, which sank off the cost of France in 1944. If the sinking of the Lusitania was one of the most publicized marine catastrophes in history, the sinking of the S.S. Leopoldville by a German U-boat off Cherbourg, France, was shrouded in mystery. "It was an American tragedy, glossed over and almost forgotten," Cussler said. "Eight hundred people died in a senseless blunder that was covered up by British admiralty, American intelligence and the French." News of the incident was censored, as was standard procedure in wartime, and families of the 800 who died were told without elaboration that their sons and husbands had been killed or were missing in action, Cussler said. Cussler and his crew of seven, aboard a 63-foot chartered vessel with $200,000 worth of electronic equipment, located the wrecks during a six-week voyage along the coasts of Britain, Denmark, Holland and France that ended July 5. A former Hollywood adman (he invented Ajax's "White Knight" campaign) who wrote fiction after his kids went to bed, the 53-year-old Cussler has produced such blockbusters as "Raise the Titanic" and "Deep Six," his most recent novel, now high on national bestseller lists. He is a tall, soft-spoken man in a seersucker suit. He chose the aircraft carrier Intrepid, anchored in the Hudson River as a tourist attraction, for his announcement. Underwater exploration provides "the glamor of searching for the unknown," he said. "Some men play golf. I've got this crazy thing about maintaining our nation's maritime heritage." Cussler has spent about $500,000 of his own money--he has earned more than $5 million in royalties from his books--looking for wrecks. Using his nonprofit group, the National Underwater Marine Agency, Inc.--after the name of the fictional federal agency featured in his novels--he donates any artifacts or money he finds to universities and museums. In five years he has located more than 30 wrecks, including two Civil War ships--the Confederacy's Florida and the Union's Cumberland--which he found in the muddy depths of Virginia's James River in 1980. Last year he made front-page news by finding Commodore Cornelius Vanderbilt's famous passenger ship, the Lexington, which sank in Long Island Sound 140 years ago. Sometimes he can't find what he wants. He has spent three summers unsuccessfully searching for the Bonhomme Richard, John Paul Jones' ship, which sank in battle off the coast of Yorkshire in 1779. Other times, he finds what he wasn't looking for. On his recent trip to Europe, he said, he came across a wreck off Weymouth, England, that fit the description of a mysterious French ship that was reported to have been torpedoed in July 1940, shortly after the Germans overran France. The ship was rumored to have been smuggling out 200 ingots of gold and other valuables, now worth up to $20 million, for French banks. It was never recovered. Denied permission by the French government to search for the Leopoldville, because the area near Cherbourg is used to test nuclear submarines, Cussler and his crew went ahead anyway. Their boat was overrun by French customs and intelligence officials, who broke open crates, scattered equipment around the boat and maintained constant surveillance with helicopters and frogmen. Cmdr. Yves Kersauson, assistant naval attach� for the French Embassy in Washington, confirmed that his government had denied permission. As for the harassment, he said, "I am not surprised. Would you like us to search in your territorial waters?" The Leopoldville, a Belgian ship transporting 2,200 troops of the U.S. Army's 66th Infantry division, embarked from Southampton, England, on Christmas Eve 1944 carrying reinforcements for the Battle of the Bulge. But about seven miles off the shore of Cherbourg, in the rough, frigid waters of the English Channel, it was torpedoed by a German sub. Encyclopedias yield no mention of the Leopoldville, and Roderick Engert, chief of the Army's historical reference branch, couldn't find it in the standard military reference books--only in the archives of the 66th division. Cussler--along with survivors of the sinking--said the indifference is deliberate, due to shame over the actions of military authorities who could have saved many more lives, but for the incompetence and confusion that surrounded the incident. "It was a screw-up," Cussler said. "There's been very little written, because the government didn't want to play it up." Cussler said the troops were not given standard lifeboat, fire or abandon-ship drills. No orders were issued to use life rafts, and it wasn't until 30 minutes after the torpedo that Cherbourg was signaled to send assistance. On shore, most command posts were vacant, he said, as officers celebrated the holiday. The single destroyer accompanying the vessel took as many men as it could, but more than 800 soldiers were left waiting on the Leopoldville for one and a half hours before the ship sank. Help never came. "A lot of boys could have been saved if the right orders had been given," said Alexander Yarmosh, 60, of Levittown, N.Y. Robert Hesse, 60, of Linden, N.J., another Leopoldville survivor, said the crew, a group of Africans from the Belgian Congo who spoke no English, took off in the lifeboats and never returned. Among the wounded and waiting soldiers, "there were acts of heroism all over the ship," he said. "But no one ever got medals." Engert, the historian, said he was unable to comment on the allegations, but he added that the sinking was a major event, and censorship at the time would have been understandable so as not to encourage the enemy. The U-20, about 40 percent intact under 17 feet of water near Jutland, Denmark, can be excavated for historical artifacts, but it would be too expensive to raise it in full, Cussler said. As for the Leopoldville, under 150 feet of sensitive French water, "It should be designated a war memorial," Cussler said. "It is still a tomb for hundreds of American GIs just like the Arlington Cemetery or any other resting place."